It has been a long and wild climbing season on the world’s tallest mountain. Over the past few years, Mt. Everest has been widely criticized for being an over crowded stage for publicity seekers and tourist climbers who have no business being on the mountain. That hasn’t changed much this spring, but when you add in the recent brawl between three European climbers and a mob of angry Sherpas, not to mention the death of a very well known Russian mountaineer earlier this week, the 2013 season has been a strange and difficult one indeed. But for most of the climbers, the end is now in sight. After nearly two months away from home and weeks of acclimatizing at altitude, all of their preparation is about to pay off. Summit Day has arrived at last. The summit of Everest has remained an elusive place thus far this spring. A week ago two teams of Sherpas completed the job of fixing the ropes to the top of the mountain from both the North Side in Tibet and the South Side in Nepal. A couple of daring and experienced climbers followed closely behind and were able to top out just before a system of bad weather moved in. Since then, high winds have kept the summit out of reach and challenged the patience of the other teams waiting to make their ascents. Over the past few days, a number of those teams attempted to reach the top, but most of them were turned back by persistent bad weather. Today the skies cleared, the winds have calmed and temperatures have even warmed a bit making it a perfect day to climb to the top.Most of the climbers launch their final push to the summit from Camp 4, located just below the so-called “Death Zone” at approximately 26,000 feet. It will take them hours to reach the 29,029-foot summit where they’ll stumble onto the ridge with a mix of exhaustion and exhilaration. They’ll have just a few minutes to enjoy the view and savor their accomplishment, because any mountaineer will tell you that the summit is only the halfway mark. They’ll still need to descend back to their starting point at C4, where they’ll get some much needed rest before continuing further down tomorrow. The biggest challenge the climbers will face on their way to the summit will be the incredibly thin air. Most will use bottled oxygen to help them breathe at high altitude and to stave off the effects of altitude sickness, which can be deadly at such heights. Long lines will also form at a couple of strategic points on the mountain as the exhausted mountaineers struggle to overcome a few technical challenges just below the summit. While standing in those lines the thin air and cold temperatures will have an opportunity to conspire against the climbers as well, making frostbite a real possibility. For many, Summit Day is the culmination of years of hard work, dedication and focus. Today, and over the next few days, dozens of climbers will see their sacrifice pay off at last. Those who do make it to the top will enter an elite group of men and women who have stood at the top of the world. The only thing Sonya Looney racks up faster than victories on the international mountain bike circuit is frequent flier miles. Between racing and her day job – she works in sales and marketing for Ergon, one of her cycling sponsors – Looney’s on the road two weeks out of every month, so she’s picked up her share of favorite spots across the globe. Stamps from Haiti, Nepal, Germany, Costa Rica and Brazil line the pages of her passport. But despite visiting some of the most breathtakingly beautiful spots across the globe, it can be hard for the Topeak Ergon Racing Team rider to focus on the scenery as she’s screaming by on her Canyon mountain bike. Although the fun-loving Looney has the effervescent air of the stereotypical girl next door, she’s an incredible competitor and a tough-as-nails athlete, as evidenced by her multiple national cycling championships and incredible racing pedigree. During the recent 10-day Yak Attack in Nepal – she won the overall race in 2012 and finished first among women in 2013 – Looney trudged through knee-deep snow up the 18,000-foot Thorong La Pass, her bike on her back. Following the oxygen-starved, three-hour trek up the mountain, she then had to descend back down the same way. Considered the hardest mountain bike race in the world, the 160-mile La Ruta de los Conquistadores forces riders to climb more than 20,000 muddy vertical-feet over three sweltering hot days. Illness forced her to drop out after 6 miles on day two, but Looney decided to ride the 43-mile finale the next day for fun. That fun included gingerly crossing a rickety railroad trestle 200-feet over a crocodile-infested river before finishing on the gorgeous La Playa Bonita beach on the Caribbean Sea. Looney was gracious enough to share some of her experiences with Gadling. What’s your favorite place that you’ve visited? My favorite country so far has been Nepal. I love the warm people, the culture, the contrast between different cities, the (mountains), great options for photography, and all the different activities. The country is a huge playground. There are also lots of opportunity to do volunteer and non-profit work. I’d love to go live there for six months doing just that! I often have to get back pretty quickly after a stage race because I had to take time off work to go. I would love to have another week to just travel, relax and explore. I normally get two days post-race to hang out before heading home. I love to go for rides exploring the area, walking for hours, checking out the architecture, and eating all the different foods. I’ll dabble before a race, but I’m always concerned with staying healthy. I’ll go for shorter walks and be more cautious with food and drinks. After the race, it feels less stressful because the consequences of being overly tired or sick are way less severe! I love visiting new places because it always gives me a new perspective. Of course, the more obscure the place, the more out of my comfort zone I get. Even though it’s sometimes a challenge, I love to be put into different situations. Plus, it makes traveling in the US seem so easy! I love making new friends, and seeing how other people live their lives. What are some of the problems with flying with a bike? If you can, weigh your bags in advance. There’s nothing worse than having to open up your bike case to take stuff out in the middle of an airport. That said, if you have extra weight leftover to bring you to 50 pounds, put a few things in the bike box. My bike has never been damaged in transit. I use an Evoc case, and previously used cardboard boxes. I take great care to pack my bike properly. However, an airline has lost my bike before. I was going to Brazil for a stage race. The airline lost both my bike and my suitcase – as well as my teammate’s who was on a separate flight – for days, and I couldn’t start the race. It was very stressful and very disappointing. They gave me a small travel voucher, but it didn’t even come close to covering the cost and the loss of experience from their negligence. I don’t really have a favorite I can recall. I like to buy local art or handmade crafts from wherever I go and decorate my house. I got a couple of really cool paintings from Haiti that are my favorites right now. I also bought a mandala from Nepal that is about to get framed that I’m pretty excited about. I really love the Pad Thai I had in Bangkok this year. I had a day there passing through and ate as much Thai food as I could. I know that sounds boring and generic, but it was really freaking good! It had these little salty, dried shrimps in it, too. I love the Pao de Queso from Brazil, too. It’s this doughy cheesy bread ball. So good! I used to love Chicken Tikka Masala until I got food poisoning (on the plane ride home) … I still can’t eat it. Oddest thing you’ve ever eaten? You’re leaving for two weeks. What’s in your suitcase? It just so happened I packed my suitcase for two weeks yesterday! Camera, spare memory cards, laptop, iPod, bike shoes, helmet, pedals, ride clothes for different temperatures, running shoes, bright socks, sunglasses, ball cap, skort, flip flops, Garmin, Gortex jacket, a few dresses, a pair of fun wedge shoes, my favorite T-shirts, down jacket, fun earrings, everyday clothes, race stuff if I’m racing. It really sort of depends where I’m going! My iPod and my camera. I love music. It also really helps me sleep in places that do not have quiet nights … think dogs barking, roosters crowing and people talking. I take tons of photos; I rarely leave home without a camera. Frequent flier? Flying domestic? Buy the Classic Fare on Frontier. If you have a bike and a piece of luggage, it ends up being cheaper because there are no baggage fees and you get extra perks with it as well. For international travel, I like a window seat. I can sleep if I put one foot up and I normally put it on the back of the armrest of the seat in front of me without my foot getting in the way (of the other person. I can also sleep if I slouch down and curl into a ball against the wall and turn on my iPod. Yesterday marked the 50th anniversary of the first American to summit Mt. Everest, the tallest mountain on the planet at 29,029 feet in height. That successful venture came ten years after Edmund Hillary and Tenzing Norgay made the first ascent of that mountain, but in the decade that had followed only four other climbers had managed to stand on top. The 1963 expedition would not only put an American on the summit for the first time, it would also open an entirely new route that had never been climbed before. That expedition would also go down in history as one of the most daring and successful ever, setting the standard for those that would follow. Ironically enough, the expedition was actually led by a transplanted Swiss climber by the name of Norman Dyhrenfurth. He took a team that consisted of 19 Americans, 32 Sherpas and 909 porters carrying 27 tons of gear and equipment to the mountain. In those days there was no airport in the Everest region, so that trek began in Kathmandu and covered 183 miles on foot. It took a month just to reach Base Camp, which was where the real work would begin. In the early weeks of the expedition the team concentrated on acclimatizing to the altitude and preparing for the challenges of climbing the South Col route pioneered by Hillary and Norgay. Those efforts payed off early on when 34-year-old Jim Whittaker of Seattle, WA, and his Sherpa guide Nawang Gombu, planted the U.S. flag at the summit on May 1. It was a huge day for Whittaker personally and an even bigger one for American mountaineering.But the expedition was far from over. On May 22, three weeks after Whittaker’s historic climb, four more Americans would head to the top of the world. Barry Bishop and Lute Jerstad would once again go up the South Col while their companions Tom Hornbein and Willi Unsoeld would attempt a difficult new route along the West Ridge. No one had ever approached the summit from that direction before and it would be a true test of their skill and endurance. Not only did Hornbein and Unsoeld successfully manage to complete that route, they met Bishop and Jerstad on the summit. Those two men had endured an eight hour climb in high winds to reach the top as well, and while there they managed to capture the first ever video footage from the summit of Everest. Any mountaineer will be quick to tell you that the summit is only the halfway point and the four men still had to get back down safely. They started to descend just as the darkness of night settled over the mountain, making an already treacherous experience even worse. At one point, the two groups became separated and Bishop and Jerstad had to stand in place for several hours, calling out to the companions in an effort to help lead them with the sound of their voices. Eventually they were reunited, and the descent would continue, but after stumbling along in the darkness for several more hours they decided to risk bivouacing for the night. Using a rock outcropping as shelter, the men huddled close for warmth. Without tents or a sleeping bag, they knew their chances of survival were slim, but they didn’t relish the idea of falling down the South Col in the darkness either. The high winds subsided some, bringing a small measure of comfort. But they were all freezing, exhausted and hungry. Their chances of survival looked grim. But survive they did and the dawn brought them new hope. Resuming their descent they came across teammate Dave Dingman, who had abandoned his own summit bid to search for his missing friends. Dingman and a Sherpa brought bottled oxygen for the team and then helped to safely lead them back down the mountain. Unsoeld and Bishop had suffered severe frostbite to their feet however and would need to be evacuated as quickly as possible. In the end, Unsoeld would lose nine of his toes and Bishop would lose all ten, plus the tips of his little fingers. When it was over the expedition set a new standard for high altitude mountaineering. 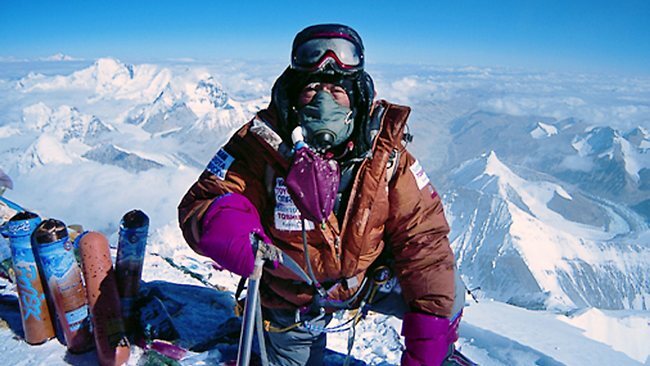 The U.S. team had put five climbers on the summit, more than any other before it. It also opened a new route along the West Ridge, which remains one of the greatest achievements in mountaineering history. The summit push marked the first time that two teams simultaneously approached the summit from different routes as well, something that others would do in the years that followed. The five-minute video below was released by National Geographic following this important climb back in 1963. It spotlights some of the difficult conditions the American team faced while on Everest. Today, there are hundreds of successful summits each year on that mountain, but back then it remained an elusive and deadly challenge.